"Relive your childhood celebrations in this upscale bowling alley"
"This makes nice for a group date or first date or even alternative plans when you’re trying to escape the rain..."
"Change the complexion of a drink with your choice of scotch"
"It’s not only an upscale boutique bar and bowling alley, but you can try your hand at indoor bocce ball, ping pong and more"
"Try upscale alley fare including tacos and wood-fired pizza, in addition to beer, wine and cocktails"
"BEST PLACE TO VISIT FOR FOOD, DRINKS AND UPSCALE BOWLING"
"AN UPSCALE BOUTIQUE ADULTS-ORIENTED BOWLING ALLEY WITH IMPRESSIVE FOOD AND WINE MENUS"
"THE PAINTED DUCK, THE WESTSIDE'S ANSWER TO THE PAINTED PIN..."
"HOWIE THE GREAT IS WELL KNOWN FOR HIS REGULAR PERFORMANCES AT THE PAINTED PIN"
"THE PAINTED PIN FEELS LIKE A MILLIONAIRE'S GAME ROOM..."
"WHEN IT COMES TO BARS, OUTSIDE OF DOWNTOWN THERE ARE A FEW AREAS THAT CAN COMPETE...ONE OF THE BEST IS IN UPSCALE AREA IS THE PAINTED PIN"
"REBEL AND COSTARS ENJOYED SIGNATURE NIBBLE INCLUDING THE PAINTED PIN'S TPP SLIDERS"
"BOWLING IS THE HEART OF THE CONCEPT, BUT THE PAINTED PIN ALSO BOASTS CUSTOM INDOOR BOCCE COURTS, TWO OVERSIZED BASKETBALL POP A SHOTS, TABLE SHUFFLEBOARD, PING PONG, SKEE-BALL, GIANT JENGA, AND SOUTHERN SKITTLES"
"THE PAINTED PIN IS NOTHING LIKE THOSE BOWLING ALLEYS..."
"YOU'LL NEVER THINK OF BOWLING THE SAME WAY AGAIN"
"BOWLING IS AN EASY WIN, UNLESS OF COURSE YOU CAN'T BOWL"
"WE WERE FEATURED IN A FILM CREATED BY VIRGIN ATLANTIC AIRLINES "VIRGIN ATLANTIC DESTINATION GUIDES: ATLANTA". IT AIRED ON THEIR YOUTUBE CHANNEL, WEBSITE, AND THE FILM IS CURRENTLY AVAILABLE TO VIEW ON BOARD ALL VAA AIRCRAFT"
"THIS UPSCALE BOWLING ALLEY BOAST DELICIOUS FOOD AND FULL BAR"
"THE WHOLE FAMILY CAN HAVE SOME COOL FUN AT THE BOWLING ALLEY "
"THE PAINTED PIN'S GIN PUNCH COMBINES GIN, LEMON,GRAPEFRUIT, OLEO-SACCHARUM, AND BUBBLES"
"THE PAINTED DUCK, A SISTER CONCEPT TO THE PAINTED PIN IN BUCKHEAD, WAS RECENTLY SIGNED TO NEARLY 25,000 SQUARE FEET AND WILL OFFER A RESTAURANT AND ENTERTAINMENT CONCEPT FROM JUSTIN AMICK AND WILLIAM STALLWORTH"
"FEATURING THE PAINTED PIN'S TRIP SANDIFER"
"A WHIMSICAL PLAY LAND SMACK IN THE HEART OF BUCKHEAD"
"TRIP SANDIFER OF THE PAINTED PIN RECENTLY WON BOMBAY SAFFPHIRE'S MOST IMAGINATIVE BARTENDER COMPETITION IN NEW ORLEANS"
"A GREAT OPTION FOR GROUPS...IT'S MORE THAN A BOWLING ALLEY"
"UPCOMING: ATLANTA HAWKS PLAYER KENT BAZEMORE PLANS A WEEKEND OF FUN PHILANTHROPY, INCLUDES THE PAINTED PIN"
"THE RECREATION IS DECIDEDLY MORE GROWN-UP AT THE PAINTED PIN"
"IT IS ESSENTIAL TO OFFER AN ARRAY AND BALANCE OF CLASSIC AND ADVENTUROUS SELECTIONS, JUSTIN AMICK, ADVANCED SOMMELIER"
"FOR THE CLASSY BUNCH...THE PAINTED PIN IS TRULY A PLAYROOM FOR ADULTS"
"YOU WOULD BE SURPRISED AT THE WHISKEY SELECTIONS AT THE PAINTED PIN"
"THE PAINTED PIN IN BUCKHEAD IS WHAT HAPPENS WHEN A BOWLING ALLEY MEETS A SLICK COCKTAIL LOUNGE"
"TRIP SANDIFER, BARTENDER AT THE PAINTED PIN, MENTIONED IN THE MIRACLE ON MONROE POP-UP BAR"
"OWNERS OF THE PAINTED PIN PLAN THE OPENING OF A,"DISTINGUISHED DRINKERY, DUCKPIN BOWLING AND GAMING PARLOUR"
"CHEF THOMAS COLLINS AND MIXOLOGIST TRIP SANDIFER OF THE PAINTED PIN WILL CRAFT THE COCKTAIL PROGRAM AT THE PAINTED DUCK"
"BEST BOWLING ALLY: THE PAINTED PIN"
"PUNCH BOWLS TAKE THE PLACE OF BEER PITCHERS..."
"IT'S FUN, UNEXPECTED, AND DEFINITELY HAS A GREAT WINE SELECTION "
"...JUST ABOUT QUAFFS ANY SUMMERTIME CRAVING..."
"IT'S TIME TO SHAKE THINGS UP WITH A VISIT TO BUCKHEAD'S PAINTED PIN"
"FOR THE CLASSY BUNCH...THE PAINTED PIN IS TRULY A PLAYROOM FOR ADULTS "
"TRIP SANDIFER OF THE PAINTED PIN RECENTLY WON BOMBAY SAPPHIRE'S MOST IMAGINATIVE BARTENDER COMPETITION IN NEW ORLEANS"
"YOU'LL NEVER THINK OF BOWLING THE SAME WAY AGAIN AFTER A VISIT TO THE PAINTED PIN"
"THE PAINTED DUCK, A SISTER CONCEPT TO THE PAINTED PIN IN BUCKHEAD, WAS RECENTLY SIGNED TO NEARLY 25,000 SQUARE FEET AND WILL OFFER A RESTAURANT AND ENTERTAINMENT CONCEPT FROM JUSTIN AMICK AND WILLIAM STALLWORTH." "THE PAINTED PIN'S GIN PUNCH COMBINES GIN, LEMON, GRAPEFRUIT, OLEO-SACCHARUM AND BUBBLES." "THE WHOLE FAMILY CAN HAVE SOME COOL FUN AT THE BOWLING ALLEY"
"THIS UPSCALE BOWLING ALLEY BOASTS DELICIOUS FOOD AND A FULL BAR." "WE WERE FEATURED IN A FILM CREATED BY VIRGIN ATLANTIC AIRLINES 'VIRGIN ATLANTIC DESTINATION GUIDES: ATLANTA.' FILM IS CURRENTLY AIRING ON THEIR YOUTUBE CHANNEL WEBSITE AND ON BOARD ALL VAA AIRCRAFT"
"BUCKHEAD BUSINESS ASSOCIATION NAMES JUSTIN AMICK AND WILLIAM STALLWORTH, FOUNDERS OF THE PAINTED PIN, 'BUCKHEAD ENTREPRENEURS OF THE YEAR"
"THE PAINTED DUCK WILL BE A 'DISTINGUISHED DRINKERY, DUCKPIN BOWLING AND GAMING PARLOUR"
"ONE OF TWO METRO ATLANTA BUSINESSES NAMED TO BUSINESS INSIDER'S 50 COOLEST NEW BUSINESSES IN AMERICA FOR 2015"
"A BAR, BOWLING ALLEY, AND INDUSTRIAL EVENT SPACE ALL IN ONE." "A SOPHISTICATED DATE VENUE PERFECT FOR SOCIALIZING AND PEOPLE WATCHING"
"THE ULTIMATE STOP FOR OFF-THE-BEATEN PATH BACHELORETTE PARTIES"
"BRING YOUR CO-WORKERS OR BIRTHDAY PARTY TO THIS INDUSTRIAL WAREHOUSE SPACE"
"WE'VE CALLED IN GAMING EXPERT - JUSTIN AMICK, CO-OWNER OF ATLANTA'S FAVORITE BOUTIQUE BOWLING ALLEY"
"THE UBER COOL ATMOSPHERE OF THE PAINTED PIN IS PERFECT FOR GROUPS"
"REASON TO VISIT THE BATHROOM: THE PAINTED PIN"
"GET YOUR PARTY ON AT THE PAINTED PIN"
"PLENTY OF ROOM TO, WELL, SPARE." "UPSCALE BOWLING ALLEY AND BOUTIQUE BAR"
"THIS REFRESHING SIPPER'S GREAT WHETHER KNOCKING DOWN BOWLING PINS OR JUST LOUNGING AT THE BUCKHEAD BAR AND ENTERTAINMENT MECCA." "THE PAINTED DUCK TO OPEN SUMMER 2016 ON WESTSIDE"
"ICONIC GAMES, GREAT CUISINE, LIVE MUSIC...MAKES IT A VERY POPULAR SPOT"
"MORE OF AN UPSCALE BOUTIQUE BAR THAN A BOWLING ALLEY"
"MEMORY-MAKER FOR YOUR FAMILY THIS SUMMER"
"THE SIGNATURE WAFFLE DOG...BECKONS HOT DOG FANS TO COME EAT"
"SWANKY MEETS EXCITEMENT...AT THIS UPSCALE PLAYGROUND"
"A MODERN TWIST ON AN OLD FAVORITE"
"...ALL THE ESSENTIALS FOR HAVING AN OUTSTANDING NIGHT IN ATLANTA"
"THIS BOUTIQUE BOWLING ALLEY OFFERS MORE THAN JUST FUN AND GAMES"
"IF YOU'RE UP FOR AN EVENING OF FUN GO BOWLING AT THE PAINTED PIN"
"IF YOU'RE FLYING SOLO, YOU MIGHT FIND SOME GOOD LEADS AT THE BAR AT THE PAINTED PIN"
"WE GENUINELY DIG THIS PLACE, FROM ITS CONCEPT TO ITS REALIZED VIBE, ITS MENU TO ITS FOOD QUALITY, COCKTAIL EXPERTISE, SERVICE OFFERINGS AND DECOR. WE'RE NOT ALONE"
"ALL THE ESSENTIALS FOR HAVING AN OUTSTANDING NIGHT IN ATLANTA"
"BOWLING WHILE SITTING ON PLUSH LEATHER SOFAS, A FULL BAR, A LIVE BAND, FLAT SCREENS GALORE PLAYING THE GAME, SWANKY LOUNGE AREAS WITH MORE GAMES AND A GOURMET MENU"
"(THE PAINTED PIN IS) PACKED TO CAPACITY SINCE OPENING IN JUNE"
"THOMAS COLLINS IS THE MAN BEHIND THE MENU AT BUCKHEAD'S BOUTIQUE BOWLING ALLEY..."
"THE PAINTED PIN, AN UPSCALE BOWLING BOUTIQUE IN BUCKHEAD'S MIAMI CIRCLE, OFFERS FOOD AND MORE THAN 25 SIGNATURE COCKTAILS CONDUCIVE TO MOVEMENT AND UNINTERRUPTED BOWLING." "THE PAINTED PIN GLORIFIES THE GAME WITH CLUBBY BRIT DECOR REMINISCENT OF SOHO HOUSE (CHESTERFIELD SOFAS, PERSIAN RUGS) AND NEAPOLITAN PIE OVENS...BOUTIQUE WINES AND CRAFT COCKTAILS AND BEERS ARE CURATED BY ITS COFOUNDING SOMMELIER." "YOU'RE GOING TO WANT TO PUT YOUR GAME FACE ON FOR THIS ONE." "HOT, FRESH-OUT-OF-THE-FRYER PORK SKINS ARE ARE DUSTED WITH RANCH AND CHEDDAR POWDER..."
"A WALNUT AND LEATHER TUFTED BAR IN THE MIDDLE OF THE VENUE LEADS TO AN INDOOR COURTYARD AREA THAT DIVIDES 20 BOWLING LANES VIA MASONRY WALLS LINED WITH TOPIARIES AND GAS LANTERNS." "ITS A BOWLING ALLEY...BUT IT'S MORE OF A SCENE. WE WOULD RECOMMEND THIS AS A GREAT DATE NIGHT OPTION." "A ONE OF A KIND BOWLING CENTER...THIS STUNNING ESTABLISHMENT (IS) 24,000 SQUARE FEET OF BRITISH PREP MEETS SPEAKEASY, VERY UPSCALE BOWLING AND FULL CONCIERGE SERVICE INCLUDING VALET PARKING." "YOU CAN BOWL IF YOU WANT, BUT DON'T MISS THE GIN PUNCH OF A MOSCOW MULE SLUSHIE. A FLIRTY GAME OF SKEEBALL OR SHUFFLEBOARD, A LIVE DJ, A DANCE FLOOR...THERE'S NO WAY YOU WON'T HAVE ENOUGH MOVES TO SECURE THAT FOURTH DATE." Atlanta Magazine Buckhead is Back! "On the Town: A Third Date"
"...A SERIOUSLY SWANK AMBIANCE. LUSH REDS, PLUSH LEATHER COUCHES AND FLOWING DRAPERY BRING LUXURY TO THIS TUCKED-AWAY BUCKHEAD LOUNGE-SLASH-GROWN-UP-PLAYPEN..."
"UPSCALE BAR, BOWLING AND ENTERTAINMENT VENUE"
"...IT'S BOWLING ON THE UPSCALE, WHERE VINTAGE BROWN LEATHERS, CHESTERFIELD SOFAS, AND DRAMATIC SPOTLIGHTING FUEL A PREPPY BRITISH VIBE IN AN INDUSTRIAL WAREHOUSE. SIDE GAMES LIKE BOCCE BALL, A LIVE DJ (AND MUSIC), AND A LOADED BEVERAGE PROGRAM MAKE THIS THE IDEAL SPOT FOR LATE-NIGHT REVELRY." 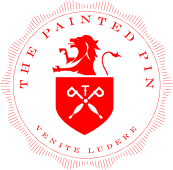 "THE PAINTED PIN OPENED RECENTLY IN BUCKHEAD. IT IS SO COOL! IT IS THE NICEST BOWLING ALLEY I'VE EVER BEEN TO." "NEWLY ENGAGED COUPLE - AND 25 OF THEIR CLOSEST FAMILY AND FRIENDS - GATHERED AT ATLANTA'S PAINTED PIN FOR A NIGHT OF BOWLING, LAUGHS AND AN ALL-AROUND GOOD TIME." "THIS BOWLING ALLEY TAKES A 'PETITE' BEEF FRANK AND COATS IN IN MALTED BATTER, GIVES IT THE OLD CROSS-HATCH TREATMENT, AND THEN PAIRS IT WITH A SWEET SOY AIOLI DIPPING SAUCE, GIVING YOU A CHANCE TO EAT TWO OF THE WORLD'S BEST FOODS...AT THE SAME TIME! ON A STICK!!" "THE PAINTED PIN IS NOT YOUR MAMMA'S BOWLING ALLEY..."
"THE FUTURE OF BOWLING HAS ARRIVED, AND IT TASTES LIKE WOOD-FIRED PIZZAS, MALTED MINI WAFFLE DOGS W. SWEET SOY AIOLI, AND HICKORY-SMOKED PORK RIBS W. TART SLAW, PLUS SIGNATURE 'TAILS LIKE A MOSCOW MULE SLUSHIE, AND A BOURBON PUNCH W. LEMON, ORANGE OLEO-SACCHARUM, AND MADEIRA." "HOLD ON TO YOUR BALLS, YA'LL, THIS PLACE IS INCREDIBLE. IF YOU'VE EVER WALKED INTO BROOKLYN BOWL AND THOUGHT, OK THIS IS PERFECTION AND I WANT TO LIVE HERE (LIKE I DID), YOUR NEW YORK DREAMS HAVE BECOME A REALITY IN MIAMI CIRCLE"
"SATISFY YOUR INNER LEBOWSKI AT JUSTIN AMICK'S (AND WILLIAM STALLWORTH'S) BOUTIQUE BOWLING ALLEY. AND WHEN YOU GET HUNGRY, DINE ON CUISINE FROM THOMAS COLLINS, FORMERLY OF PARISH FOOD & GOODS." "IF YOU LIKE TO GET YOUR GAME ON, BUT PREFER GLAM TO GRITTY - THE PAINTED PIN IS RIGHT UP YOUR ALLEY." "THE PAINTED PIN, AN UPSCALE BAR, BOWLING AND ENTERTAINMENT CONCEPT FROM JUSTIN AMICK AND WILLIAM STALLWORTH, RECENTLY OPENED IN A RENOVATED WAREHOUSE IN BUCKHEAD'S MIAMI CIRCLE." "AIMING FOR POSH-PREP-SCHOOL-MEETS-HIGH-END-BREWPUB VIBE, THIS UPSCALE BUCKHEAD BOWLING ALLEY AND ENTERTAINMENT COMPLEX FINISHES MORE THAN JUST ITS 20 LANES IN SHINY WOOD AND CLEAN LINES."